The key to enjoying Yorkville these days, it seems to me, is to keep to the sidestreets. The main thoroughfares (Third, Second and First Avenues, and 86th, 79th and 72nd Street), once packed with the color of teeming German, Hungarian and Czech populations, have been scrubbed clean of interest and lined with banks and chain stores. The blocks in between are infinitely more appealing and contain, if you squint, choice remnants of Yorkville’s living past. GLASER'S BAKE SHOP: Let’s start with the good stuff, First Avenue near 87th. German pastries and cakes made from 102 years of experience. Glaser’s is one of the neighborhood’s strongest remaining ties to Yorkville’s Germanic history. Try the apple turnovers, black and white cookies or whoopee pies. And don’t fail to notice John Glaser’s name spelled in tile on the floor. SCHALLER & WEBER: Walk over to Second Avenue, just south of 86th (which was once called German Broadway). Here is the epicenter of bygone Yorkville, a sausage purveyor supreme—though you can also get almost anything else of German pedigree here as well. Schaller & Weber meats are available in many groceries citywide now, but don’t spare yourself a visit to the actual place. Here since 1937. Family-owned. HEIDELBERG RESTAURANT: To eat a hot Schaller & Weber bratwurst, walk two doors south to the sole remaining German restaurant in the area, in business since 1936 (one year before Schaller & Weber—whose sausages did they serve then?). Dark timber, frothy mugs of imported ale, waiters in leiderhosen. There used to many like it, places with wonderful names Die Lorelei, Cafe Mozart, Kleine Konditorei, and, my favorite, the Ideal Restaurant. BRANDY'S SALOON: Walk to 84th Street and head west. Brandy's has lived many lives over its time. It a speakeasy back in the day. It is currently enjoying a considerably less romantic existence as a piano bar. THE YORKVILLE CLOCK: Keep walking west on 84th and turn north on Third. This sidewalk clock is one of the few left in the city. It dates from 1898 and once stood in front of Adolph Stern’s jewelry store at 1508 Third Avenue. The E. Howard Clock Company built the clock. Stern moved it to 1501 Third Avenue in 1923 to sit in front of his pawn shop (and put three balls, the sign of pawn shops, on top of the clock). It was removed for a time in the 1980s, but howls of protest brought it back, fully restored. It had to be renovated again in 1998. It is landmarked and keeps proper time. ZION ST. MARK'S CHURCH: Turn around and walk east on 84th. Between Second and First is what was christened in 1888 the Deutsche Evangelische Kirche von Yorkville. A pretty little house of worship with the old name still carved into the façade. ST. ELIZABETH OF HUNGARY ROMAN CATHOLIC CHURCH: Go down to 83rd between Second and Third. Another religious relic of Yorkville’s ethnic past. Neo-Gothic with a great vaulted ceiling inside. OTTOMANELLI BROTHERS: Walk back to Second, down to 82nd and over York Avenue. The Ottomanelli clan split a long time ago. One branch of the family (Onofrio) stayed in the Village, on Bleecker; the other (Joseph) went way the hell up here. It remains one of the oldest butchers in the city, and one of the best as well. Also one of the greatest family names around. It looks fine on a sign. HUNGARIAN MEAT MARKET: Walk down to 81st and over to First. The remnants of Hungarian Yorkville, which was centered around 79th Street, are even harder to find that those of German Yorkville. The Hungarian Meat Market, a Schaller & Weber of its kind, traces its history back to the 1950s, though it doesn’t look very old. You can get your Tirol salami, Csabai smoked sausage, and Szekely Goulash here, as well as authentic Hungarian paprika. ORWASHER'S BAKERY: Walk down to 78th between First and Second. At No. 308 used to be this old 1916 bakery, which still lives on, after a fashion, as Over Artisans, an outfit that bought the space from the third generation of Orwashers in 2007. JAN HUS PRESBYTERIAN CHURCH: Walk down to 74th between First and Second. All the churches around here seem to have been built in the 1880s. This one served the Czech community. A weird story in connection to the church: In 1895, Pastor Vincent Pisek traveled to “Nebraska when a hunter killed a mother wolf and presented the new-born cub to Pisek who took it back to Jan Hus Church and raised it on a bottle. The wolf wandered freely around the church and was especially protective of children, who also appear to have had free reign of the place. All day in the pastor's study the wolf would sit at Pisek's feet. One day the wolf was missing and they searched everywhere until they found it curled up sound asleep inside the pulpit. Neighbors complained that the church was terrorizing the block with a wolf howling from the attic.” Jan Hus, a Czech Catholic priest, was burned at the stake in 1415 for his heretical views on the Church. ST. JOHN THE MARTYR CATHOLIC CHURCH: Walk down to 72nd, near Second. This vest-pocket church used to be the Knox Presbyterian Church, a Bohemian congregation founded in 1888. 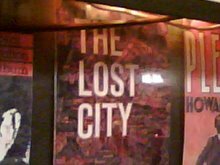 Nicely located for the time, on what was Bohemian Broadway. PAUL MOLE: Walk west to Lexington and up to 74th. They have been cutting hair at this second-floor barber for a century. WILLIAM POLL: Further up, at 75th, is this oddball purveyor of fancy dips and other delicacies, which has stood here since 1921. EISNER CHEMISTS: At 79th is this, another reminder of the area’s German past, here for many decades. LASCOFF DRUGS: Walk up to 82nd. Of all the ancient pharmacies in the city, perhaps only Bigelow is older, and none is grander than this 1899 Gothic corner masterpiece, where the sale of dental floss is treated with the seriousness of a bank transaction, and conducted in like silence. LEXINGTON CANDY SHOP: This 1925 soda fountain is a nice place to end your tour. Have a real malted milk shake, or a Coke made with genuine syrup, and rest your feet. Hi, great selections! Love the Lexington candy shop. 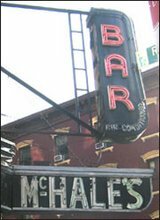 My favorite bar in the city was McHale's. Took all my out of town friends there, and felt comfortable going by myself on occasion. Thanks for creating the blog. I'm still mourning Mocca -- could have used their chicken paprikash this winter. Fantastic choices. I'm so sad to have missed the Steuben parade this year; I'll have to take this tour in person to make up for it. Oh - and also the late, amazingly great Paprikas Weiss, around 81st and 2nd. Very sad when they closed. There is also an old Hungarian Baptist Church on 80th between 2nd and 3rd, with a white cross that lights up at night. Remember Tip Top? It was a Hungarian hole-in-the-wall diner with the best Chicken Paprikas ever! There was also the amazing Hungarian bakery, Rigo. I also fondly remember Cafe Geiger. Sadly, the Hungarian Meat Market had a major fire 2 weeks ago and is shuttered. Apr 13, 2009 – There used to many like it, places with wonderful names Die Lorelei, "
But when I clicked on the link, I couldn't find any reference to Lorelei. Can anyone lead me to where I can find some info on the old Lorelei, upstairs on 86th St, I believe on the corner of Lexington Ave.? Great blog. Lived on 79th and York for over 20 years, and remember fondly not only Rigo and Mocca but Evas Kitchen and even Lorelei. I actually cried when I returned to NY for the first time on business and saw that Rigo on 78th was no longer there. You forgot a few things....The Irish was also and there and a German Bakery named Kurtz also on York ave between 80th and 81st streets. And the Bremen House, Don't forget that.